For extinct cetaceans, see List of extinct cetaceans. Conservation status codes listed follow the IUCN red list of threatened species (v. 2014.3; data current at 20 January 2015). Where available, the global population estimate has been listed. When not cited or footnoted differently, these are from the IUCN red list of threatened species (v. 2014.3; data current at 20 January 2015). The family Balaenidae contains two genera and four species. All the Balaenidae whales have no ventral grooves; a distinctive head shape with a strongly arched, narrow rostrum, bowed lower jaw; lower lips that enfold the sides and front of the rostrum; long, narrow, elastic baleen plates (up to 9 times longer than wide) with fine baleen fringes; and fused cervical vertebrae rendering the head immobile. Rorquals are the largest group of baleen whales, with 9 species in two genera. They include the largest animal that has ever lived, the blue whale, which can reach 190 tonnes, the fin whale can easily reach 50 tonnes, and even the smallest of the group, the northern minke whale, reaches 9 tonnes. They take their name from a Norwegian word meaning "furrow whale": all members of the family have a series of longitudinal folds of skin running from below the mouth back to the navel (except the sei whale, which has shorter grooves). These are understood to allow the mouth to expand immensely when feeding. All rorquals have ventral grooves, and are the only cetaceans to have them. Additionally, they all have dorsal fins, broad, gently curving rostra and short baleen plates. The pygmy right whale shares several characteristics with the right whales, although having dorsal fins separates them from right whales, and they have a very distinctive jaw configuration. Pygmy right whales' heads are no more than one-fourth the size of their bodies, whereas the right whales' heads are about one-third the size of their bodies. The pygmy right whale is the only extant member of its family, otherwise better characterized by the extinct genus Cetotherium. The gray whale has been placed in a family of its own as it is sufficiently different from the right whales and the rorquals. The gray whale is the only benthic feeding baleen whale, filtering small organisms from the mud of shallow seas. They also have a gestation period of over a year, which is unusual for baleen whales. The toothed whales (systematic name Odontoceti) form a parvorder of the cetaceans. As the name suggests, the parvorder is characterized by having teeth (rather than baleen). Toothed whales are active hunters, feeding on fish, squid, and in some cases other marine mammals. Oceanic dolphins are the members of the cetacean family Delphinidae. These aquatic mammals are related to whales and porpoises. As the name implies, these dolphins tend to be found in the open seas, unlike the river dolphins, although a few species such as the Irrawaddy dolphin are coastal or riverine. Six of the larger species in the Delphinidae, the killer whale (orca) and its relatives, are commonly called whales, rather than dolphins. They are also sometimes collectively known as "blackfish". The Delphinidae are characterized by having distinct beaks (unlike the Phocoenidae), two or more fused cervical vertebrae and 20 or more pairs of teeth in their upper jaws. None is more than 4 m long. 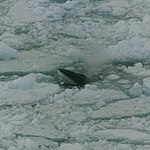 The Monodontidae lack dorsal fins, which have been replaced by tough, fibrous ridges just behind the midpoints of their bodies and are probably an adaptation to swimming under ice, as both do in their Arctic habitat. The flippers are small, rounded and tend to curl up at the ends in adulthood. All, or almost all, the cervical vertebrae are unfused, allowing their heads to be turned independently of their bodies. None has any throat grooves. The dwarf and pygmy sperm whales resemble sperm whales, but are far smaller. They are dark gray, dorsally, while ventrally they are lighter. They have blunt, squarish heads with narrow, underslung jaws; the flippers are set far forward, close to the head and their dorsal fins are set far back down the body. Porpoises are small cetaceans of the family Phocoenidae. They are distinct from dolphins, although the word "porpoise" has been used to refer to any small dolphin, especially by sailors and fishermen. The most obvious visible difference between the two groups is porpoises have spatulate (flattened) teeth distinct from the conical teeth of dolphins. In addition, porpoises are relatively r-selected compared with dolphins: that is, they rear more young more quickly than dolphins. All seven species have small flippers, notched tail flukes, and no beaks. All carry at least 11 pairs of small teeth in their upper and lower jaws. Porpoises, divided into seven species, live in all oceans, mostly near the shore. Probably best known is the harbour porpoise, which can be found across the Northern Hemisphere. The sperm whale characteristically has a large, squarish head one-third the length of its body; the blowhole is slightly to the left hand side; the skin is usually wrinkled; and it has no teeth on the upper jaw. 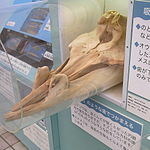 A beaked whale is any of at least 22 species of small whale in the family Ziphiidae. They are one of the least-known families of large mammals: several species have only been described in the last two decades, and it is entirely possible that more remain as yet undiscovered. Six genera have been identified. They possess a unique feeding mechanism known as suction feeding. Instead of catching their prey with teeth, it is sucked into their oral cavity. Their tongue can move very freely, and when suddenly retracted at the same time as the gular floor is distended, the pressure immediately drops within their mouth and the prey is sucked in with the water. The family members are characterized by having a lower jaw that extends at least to the tip of the upper jaw, a shallow or non-existent notch between the tail flukes, a dorsal fin set well back on the body, three of four fused cervical vertebrae, extensive skull asymmetry and two conspicuous throat grooves forming a 'V' pattern. River dolphins are five species of dolphins which reside in freshwater rivers and estuaries. They are classed in the cetacean superfamily Platanistoidea. 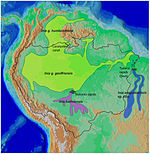 Four species live in fresh water rivers. 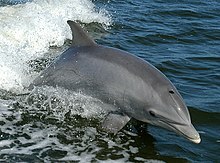 The fifth species, the La Plata dolphin, lives in saltwater estuaries and the ocean. However, it is scientifically classed in the river dolphin family rather than the oceanic dolphin family. All species have adaptations to facilitate fish catching: a long, forceps-like beak with numerous small teeth in both jaws, broad flippers to allow tight turns, small eyes, and unfused neck vertebrae to allow the head to move in relation to the body. The family Lipotidae is another monotypic taxon, containing only the baiji. Fossil records suggest the dolphin first appeared 25 million years ago and migrated from the Pacific Ocean to the Yangtze River 20 million years ago. The species was declared functionally extinct in 2006 after an expedition to record population numbers found no specimens. 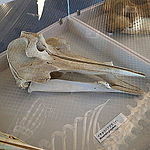 The Platanistidae were originally thought to hold only one species (the South Asian river dolphin), but based on differences in skull structure, vertebrae and lipid composition, scientists declared the two populations as separate species in the early 1970s. In 1998, the results of these studies were questioned and the classification reverted to the pre-1970 consensus. Thus, at present, two subspecies are recognized in the genus Platanista, P. gangetica minor (the Indus river dolphin) and P. g. gangetica (the Ganges river dolphin). ^ The Society for Marine Mammalogy considers Eden's whale a smaller morph of the more widespread Bryde's whale based on current research. ^ As of August 2018, the Society for Marine Mammalogy does not consider the Burrunan dolphin a distinct species due to problematic methodology in the study proposing its classification. The organization recommends further study to determine its validity. ^ a b "The IUCN Red List of Threatened Species". International Union for Conservation of Nature and Natural Resources. Retrieved 20 January 2015. ^ Karlsen, K. (1962). "Development of tooth germs and adjacent structures in the whalebone whale (Balaenoptera physalus)". Hvalrådets Skrifter: Scientific Results of Marine Biological Research. 45: 1–56. ^ a b c d e f g Martin, Dr. Anthony R. (1991). Whales and Dolphins. London: Salamander Books. ISBN 978-0-8160-3922-7. ^ Goldbogen, Jeremy A. (2010). "The Ultimate Mouthful: Lunge Feeding in Rorqual Whales". American Scientist. 98 (2): 124–131. doi:10.1511/2010.83.124. ^ a b c d e "List of Marine Mammal Species and Subspecies". Society for Marine Mammalogy. May 2016. Retrieved 16 April 2017. ^ Bjorge, Arne; A Tolley, Krystal (2008). "Harbor porpoise Phocoena phocoena". In William F. Perrin; Bernd Wursig; J. G.M. Thewissen. Encyclopedia of Marine Mammals. pp. 530–532. ^ Hoffner, Erik (2018-03-08). "Only 12 vaquita porpoises remain, watchdog group reports". Mongabay. Retrieved 19 April 2018. ^ Wang, Yongchen (2007-01-10). "Farewell to the Baiji". China Dialogue. Retrieved 2007-05-29. ^ Pilleri, G., Marcuzzi, G. and Pilleri, O., 1982. Speciation in the Platanistoidea, systematic, zoogeographical and ecological observations on recent species. Investigations on Cetacea, 14: 15–46. ^ "National Marine Mammal Laboratory - La Plata Dolphins". Alaska Fisheries Science Center - NOAA Fisheries. NOAA Fisheries. Retrieved 18 March 2019. Rice, Dale W. (1998). Marine mammals of the world: systematics and distribution. Society of Marine Mammalogy, Special Publication No. 4. ISBN 1891276034. Mead, J.G. ; Brownell, R. L. Jr. (2005). "Order Cetacea". In Wilson, D.E. ; Reeder, D.M. Mammal Species of the World: A Taxonomic and Geographic Reference (3rd ed.). Johns Hopkins University Press. pp. 723–743. ISBN 978-0-8018-8221-0. OCLC 62265494. "Red List of Threatened Species". IUCN. Archived from the original on 2006-11-02. Retrieved 2006-11-09.